There is almost always a certain amount of trepidation when embarking on a 28km backpacking outing. Despite all of the careful planning and packing, the unknown can be somewhat daunting. Questions like “how hard will this be?” or “will it be as pretty as I hope for it to be?”. The good news is that this circuit is visually stunning, and the elevation gain is fairly well spread out (expect to break a sweat though!). Despite its popularity, and the recommendation to secure overnight permits well in advance, we encountered very few other people on the trail. 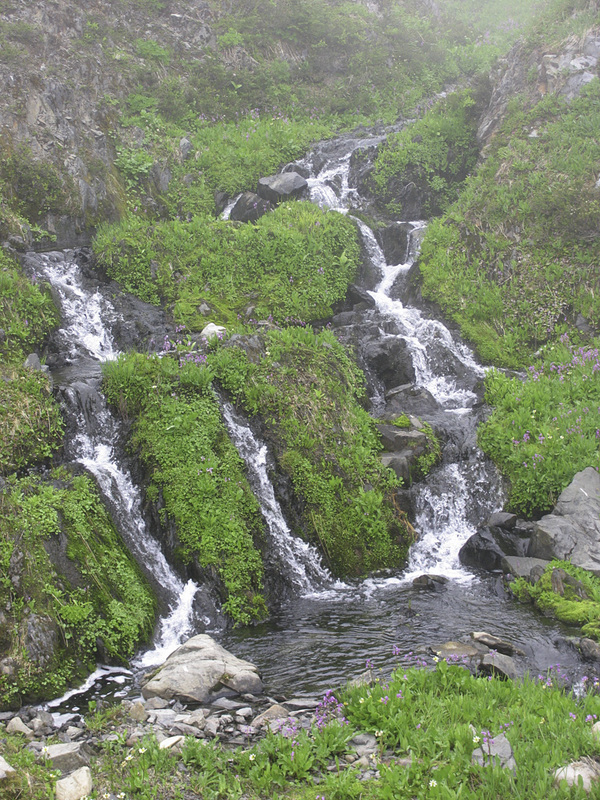 The High Divide Loop Trail starts at the Sol Duc River, and gently makes its way to the crest of the High Divide (watersheds drain from here into the Hoh River). We had the fortune of striking off under blue skies. 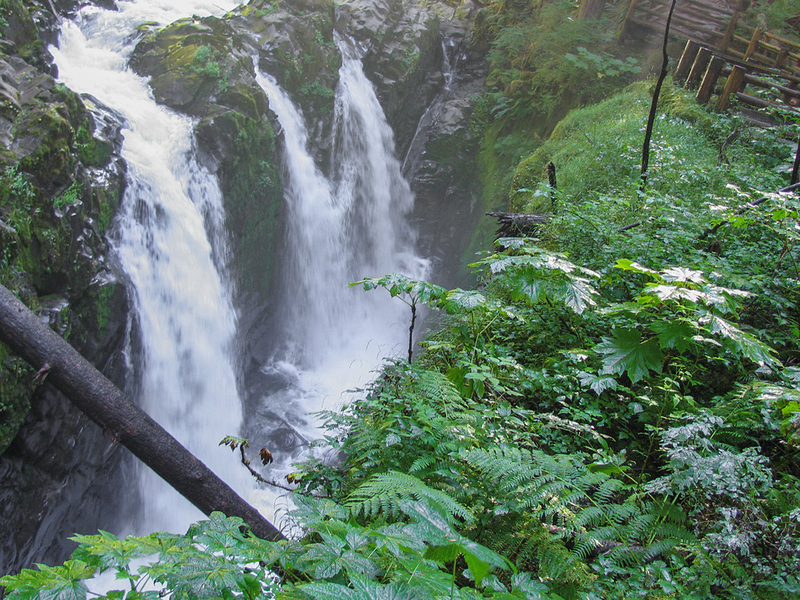 A few minutes into our trip, we came upon the Sol Duc Falls. I had never seen a 3 pronged waterfall like this before, and we allowed ourselves to be mesmerized by the flowing water in the morning light. This was also our first experience hiking among forest giants. We stopped to either take our pictures with specific trees, or craned our necks upward to admire the reach that they have. It’s not a surprise then that it took us about 3 hours to reach the far end of Deer Lake (only 5 1/2 kms from the trailhead) and seized the opportunity to splash ourselves with water, and have lunch. 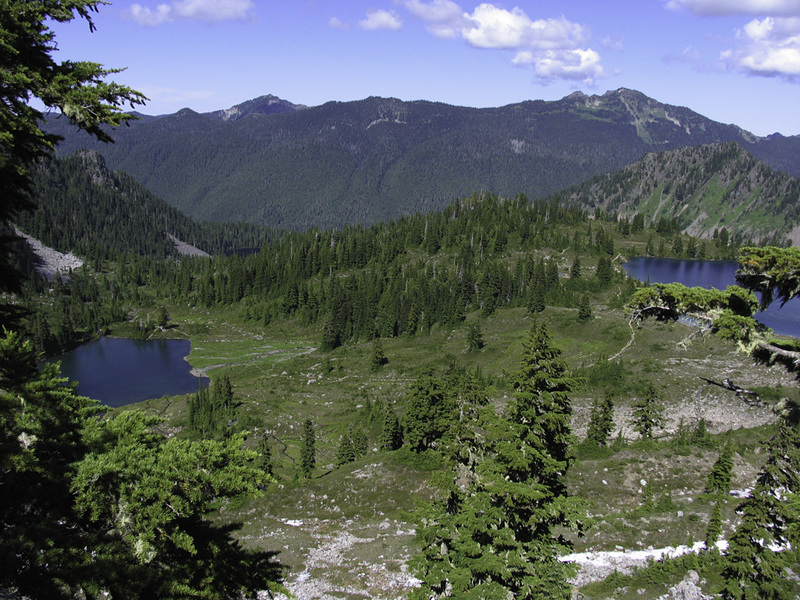 As we gained elevation, we transitioned from forest floor conditions (cool shade) to the subalpine (stunted trees, meadows and direct sunlight). It was particularly warm on this day, with temperatures reaching well into the mid 80’s, and opportunities to rest in the shade were few and far between. Even in the shade, a dry heat permeated the atmosphere. It took us just over 6 hours to cover the 10 1/2 kms from the trailhead to the spur trail for the Seven Lakes Basin, and our campsite at Lunch Lake. 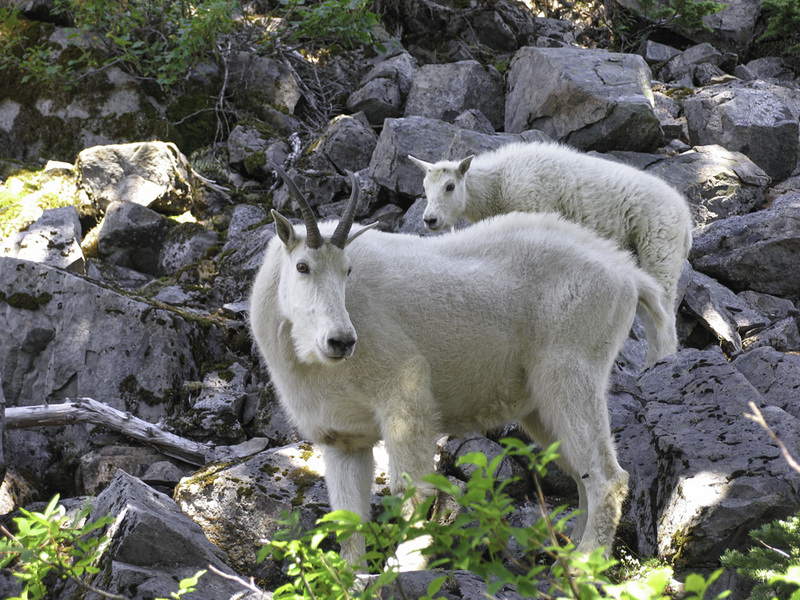 We had the mountain goats to blame for any delays on the next leg from Deer Lake this time as we were completely amazed to come face to face with a small group as we neared the turnoff for Lunch Lake. They were clearly not as impressed with us as we were with them for they paid very little attention to us. We, on the other hand, were mindful of the narrow trail that we had to share with them, and the lack of options for navigating around them. There is something to be said for the impression that the horns and strong shoulders make, and our desire to avoid contact! 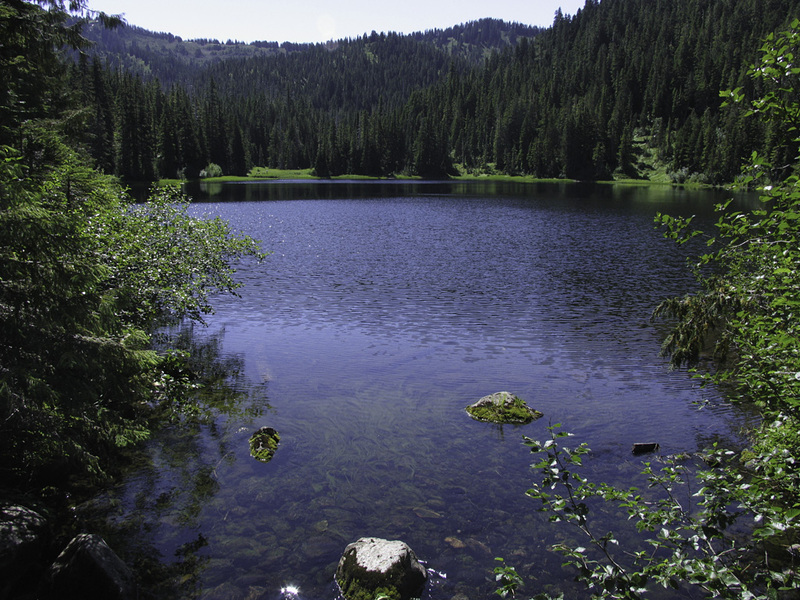 The spur trail to Lunch Lake provides a beautiful hilltop view of the basin containing both Round and Lunch Lakes, and several other lakes beyond. As we completed our descent into the basin, we quickly learned that we would be sharing the area with other creatures – swarms of aggressive mosquitos! After choosing one of many available campsites, we quickly set up camp and set about getting dinner ready. Despite frequent and generous applications of bug spray, the only way to “enjoy” dinner was to eat and walk at the same time. We eventually found some relief from the mosquitos by staying close to the shore of the lake. That evening, we met the ranger who was stationed at Lunch Lake. He told us the story of a local who makes it a point to complete the High Divide Trail as a single day outing every year on his birthday. I might not have made much of it if all 28kms were on flat terrain, but this trail has an elevation gain of just over 4,000′. The mosquitos greeted us for breakfast the next morning as well, and that was our queue to pack up our campsite in record time and make a hasty retreat back to the ridgeline. The skies were clear when we left the campground at 7:30am, but fog was starting to build and was adding a whole different look and feel to our outing. Even though a million dollar view of Mount Olympus from the ridge was in the process of being obscured by the fog rolling in from the Pacific ocean, we thoroughly enjoyed our 2nd day on the trail, and all of the moods that it displayed for us. The 2nd day of the trip left us with much more than half of the distance to complete. An additional 17 1/2 kms lay between us and the trailhead, and it would take us just over 9 hours to complete it. Once we reached the end of the ridge, it was time to start our descent back to the trailhead. Along the way, we passed a fairyesque meadow below Heart Lake that was cloaked in a magical mist and where we were certain that were about to be greeted by trolls and elves. We also saw evidence of significant damage from a recent blow down along the route, and crossed paths with a ranger in this area who was looking for trees that may have fallen onto the trail. This brief encounter with another human provided us with just enough motivation to get us through to the trailhead – yes, we were tired! Be prepared to share the trail! … but I got vertigo at the worst time!